IT organizations are perceived by the business in one of two ways - either as a cost center or a center of strategic value. Research has identified a common pattern of activity across organizations that have successfully shifted from a cost focus to delivering strategic value for the business. 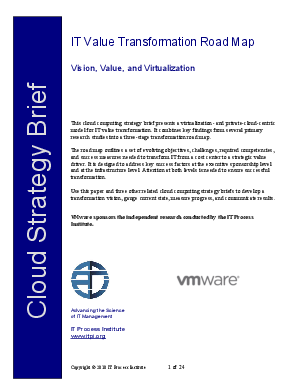 This paper combines those key findings from several studies into a three stage virtualization and private cloud centric road map for IT value transformation which highlights the objectives, challenges, required competencies, and success factors and success measures at each stage.